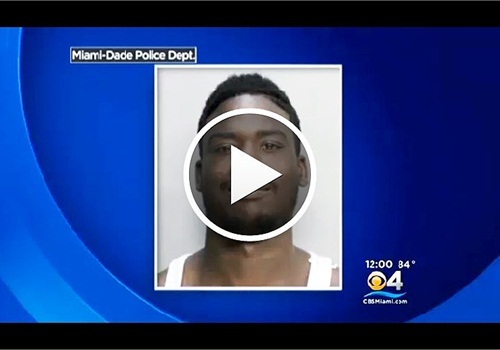 Miami-Dade police have identified 19-year old Jonathan Gilbert, known on the street as J-Rock, as the person who fired at two of the agency's Robbery Intervention Detail (RID) officers Tuesday afternoon, reports CBS Miami. The officers were patrolling in the area of NW 71st Street and NW 15th Avenue, a known high drug traffic area, when they spotted a man who they suspected was acting as a lookout. When the officers, who were in an unmarked police vehicle, rolled up to the man he pulled a gun and started shooting at them. As the officers sped off, the man continued to shoot at them. As arriving officers set up a perimeter, witnesses said they saw three males take off in an older model Chevy Impala with red doors. "From a safety stand point, this was 1 o'clock in the afternoon, children are outside, there's no school, people are home from work and he opened fire in the middle of a residential neighborhood," said Miami-Dade Detective Robin Pinkard. "This is someone we need to get off the street for the safety of the community." Gilbert, who police consider armed and dangerous, will be charged with attempted first degree murder when he's taken into custody.